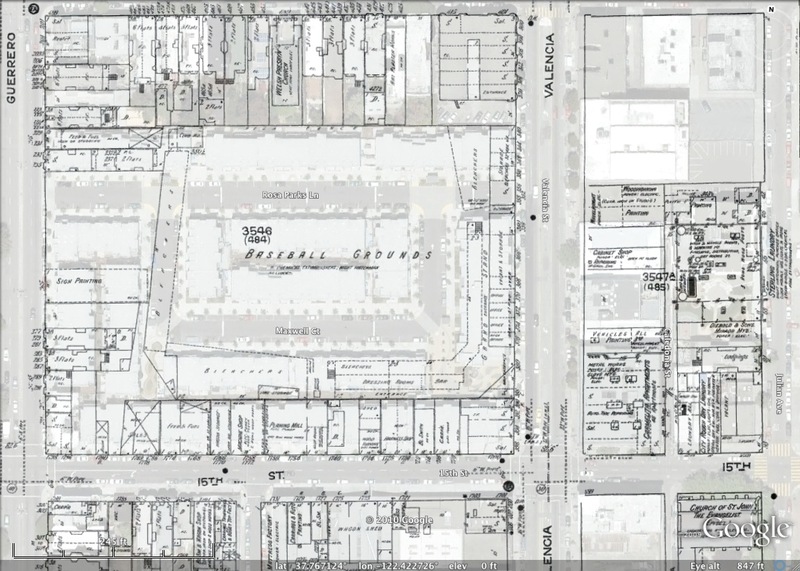 The world renowned Telstar Logistics Surveyor Unit recently highlighted the Google Earth historical image layer, specifically the San Francisco 1946 images. 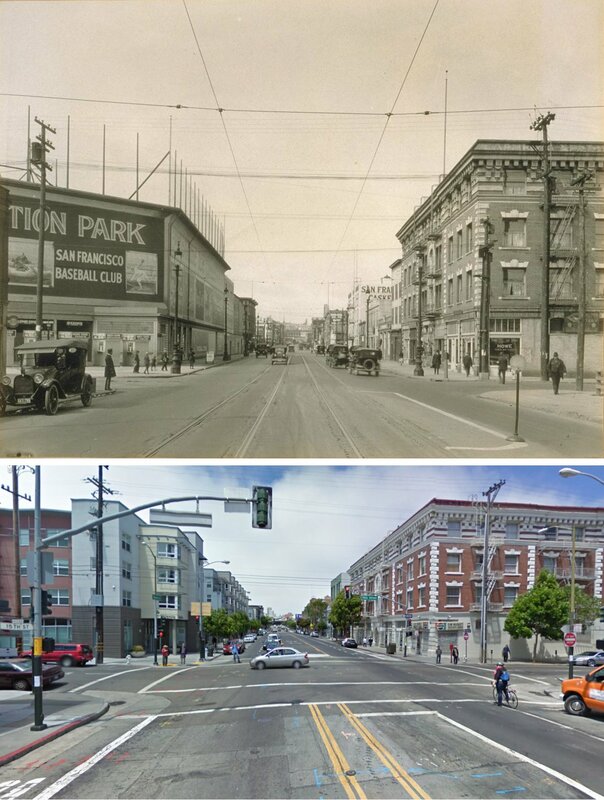 While many parts of town have stayed the same over the last 64 years, some of the changes are sobering. A great loss was the Seals Stadium on 16th between Bryant and Potrero. Facing the Bay, it was home to the Seals from 1931 until the Giants moved from NY in 1958. Seals Stadium hosted the Giants for two glorious seasons. This view from the northwest, looking southeast shows the rather magnificent curve of the entrance. The joint geocoding prowess of Telstar Logistics and Burrito Justice was put to the test as we struggled to determine the location of the four bases. The Google Earth overlay proved to have quite a bit of wiggle — 100 feet E/W and 30 feet N/S, to be precise — and we turned to our old standby, Sanborn maps. Here we see a packed stadium San Francisco’s very first major league game against the LA Dodgers on April 16, 1958 where 22,000 fans watched the Giants ‘clobber’ the Dodgers. This view faces south, with 16th on the top and Bryant on the right. 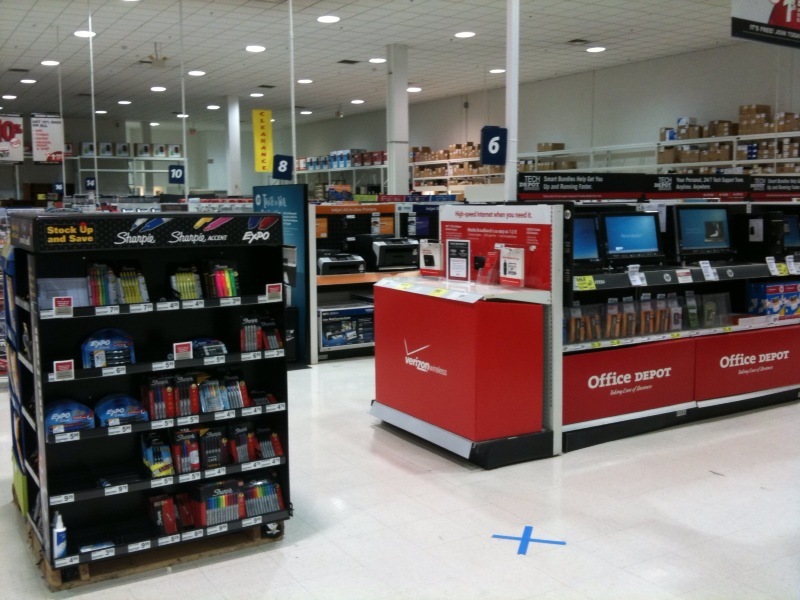 Home plate is in deep within Office Depot, while first base is at the front of the store at a cashiers check-out station. Second base is in Safeway near the Starbucks, while third is between the tortillas and the frozen pizza. Telstar Logistics: turning yesterday into today with the magic of blue tape. These hardy, flannel-clad folk are standing in line on 16th (behind the scoreboard) to buy tickets for the Giants’ opening day. Here we see Willie Mays standing in front of the marquee in 1957, shortly after the Giants announced they were moving west. Tragically, after just one and a half two seasons, the Giants moved to the monstrosity that is Candlestick, and Seals Stadium was doomed. Here is the groundskeeper tearing out home plate after the close of the Giants’ time at Seals Stadium. And early in 1960, Seals Stadium was torn down. Baseball would suffer for another 40 years until Pac Bell park came to be. Deep within Office Depot, Telstar Logistics marks home plate and many other bases. 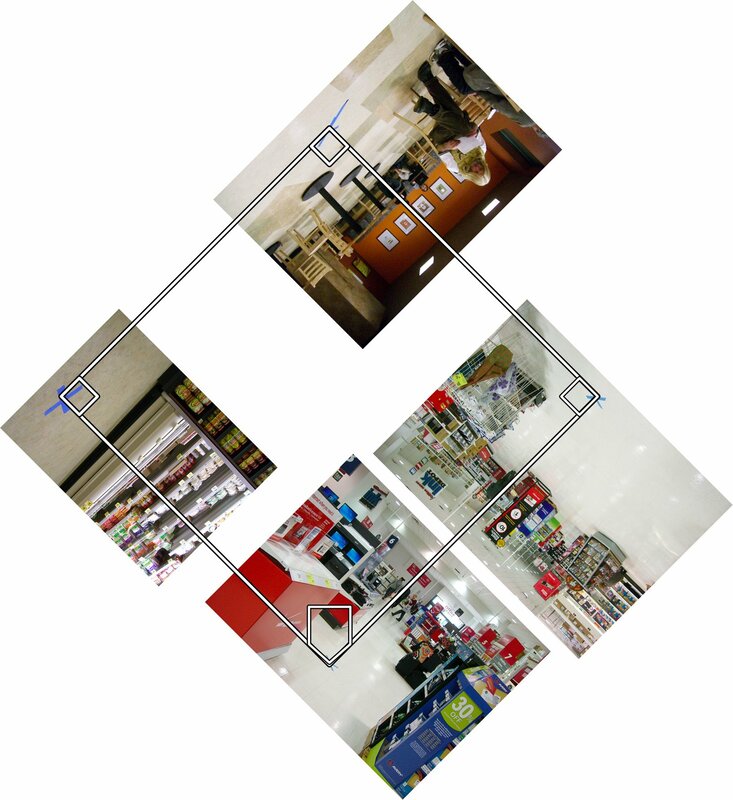 Here is a highly unorthodox attempt to align present photos with past baselines. 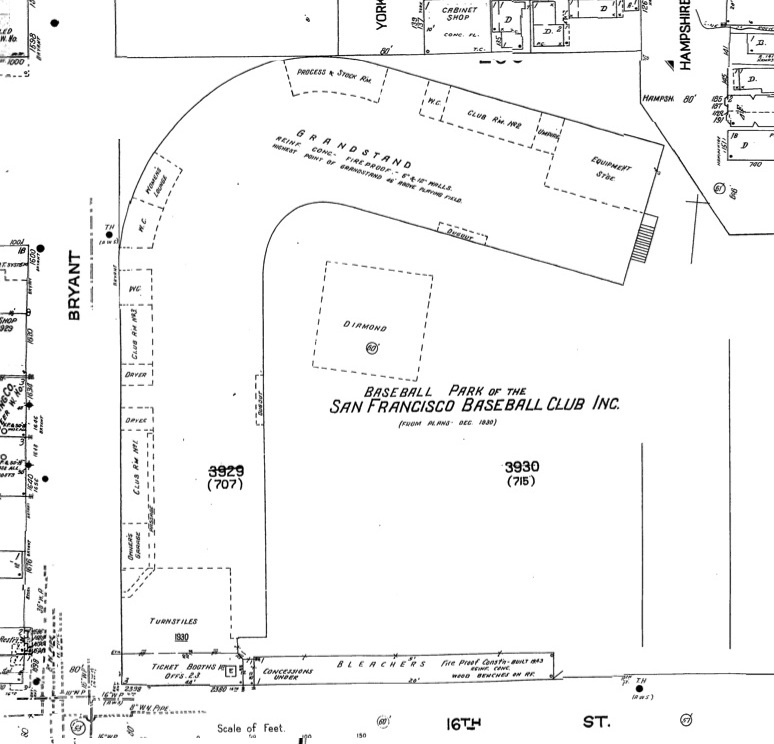 As previously mentioned on Mission Mission, the Seals were not the only team to play at 16th and Potrero. Notice from the Sanborn map that there are three dressing rooms. One was for the Seals, one for the visitors, and last was for the Mission Reds! The magic that is Sanborn shows us the park and its environs in 1914. Recreation Park was built in 1907 after the earthquake destroyed the Seals’ home on 8th and Harrison. Prior to the stadium, RP was occupied by “Chinese vegetable gardens”. Afterward it was the site of Valencia Gardens, originally built in 1943, torn down in 2004 and reopened in 2006. 1906–After the Great Earthquake a new ball park, Recreation Park was built in the Mission on Valencia between 14th and 15th streets. A section of the bleachers, roped off with chicken wire became known as the “booze cage.” Admission price entitled the patron to a choice of either a sandwich or a shot of whiskey. Spectators who frequented the “cage” were said to be knowledgeable, loud and abusive. The team name was changed to the San Francisco Seals. The Seals featured a “reversed battery” of Nick Williams and Orval Overall–one would pitch, the other catch, then the roles would reverse for the following game. Overall eventually became a 20-game winner in the National League. Anyway, the next time you ride your fixie down Valencia, think of Rec Park (and more importantly, the whiskey/chicken dilemma you faced a century ago). Telstar Logistics has much more on locking down the actual base locations in Safeway and Office Depot over at Laughing Squid. Not much to add, but wonderful post. Probably my favorite since I started reading this blog. It’s nice to be reminded of the Mission Reds. Also, the Giants put up a plaque at 16th and Bryant to commemorate their 50th Anniversary in SF a couple years ago. Oddly, it’s in the shape of a home plate, but it’s where the Right Field corner used to be. I guess that’s because they wanted more people to see it. Actually, I walked by the plaque just after I wrote this comment and my memory decieved me. It is not in the shape of home plate after all. Since the mound was probably lower than where the Office Depot currently is, wouldn’t it technically be where the 24 Hour Fitness is located underneath the Office Depot? I suppose so, but as Seals Stadium extends through both time and space, I am comfortable extruding vertically. Double Play at 16th & Bryant has some awesome pictures of Seal Stadium up from the waybackwhen also. And a great breakfast burrito. I’m guesstimating, but I think home plate was located on the 2nd floor of 24 hr fitness, where the free weights are. another amazing post. keep hitting em outta the park! Really, a choice of a sandwich or shot of whiskey upon admission. On getting Office Depot et. al. to mark home plate: Here in Seattle the Lowe’s on Rainier has markers for where home plate and the pitcher’s rubber were at Sick’s Stadium, which stood on the same site until the park was demolished a couple years after the Mariners moved into the Kingdome. Here’s a Flickr set of the markers (not my pics). Good to know that then, as now, a man (or an accompanied woman) could pop into any number of nearby establishments pre- or post-game for a refreshing libation. Great work, as usual, johnny0. Nice work y’all, per usual. There’s a couple of then and now street views of the old Recreation Park on LookBackMaps. Wow Jon, thank you, I had never seen that shot before. Nice job on the alignment. I’d love to talk to you about figure out how to dynamically make the higher-resolution comparison I hacked together. Sure thing. Let me know how I can help and I’ll do what I can. We’re actually hoping to release LookBackMaps as a free iPhone app in the next few months, and it has a feature that lets you view the old photo laid right over your camera view, so it puts you right in the past. There’s a video and demo on our site. We may be looking for beta testers in a bit if you’re interested. Excellent work! I’ve always felt a little bit of history in Safeway’s parking lot, imagining Willie Mays roaming the outfield. As for Rec Park, I used to go to the gym across the street, and was met with skepticism whenever I mentioned Valencia Gardens used to be a ball park. The Hotel Royan at 15th and Valencia used to house ballplayers, unlike the current denizens. Thank you for a wonderful post. Don’t forget Ewing Field, near Masonic, where the Seals played for the second half of the 1914 season. They learned to their regret that the weather out that way is not so good during the summer. Wow! As a former geologist, present history teacher, NY Giants and Willie Mays fan, and proponent of mass transit – thank you. This site is great. I do appreciate all of the information that was provided here on this site. 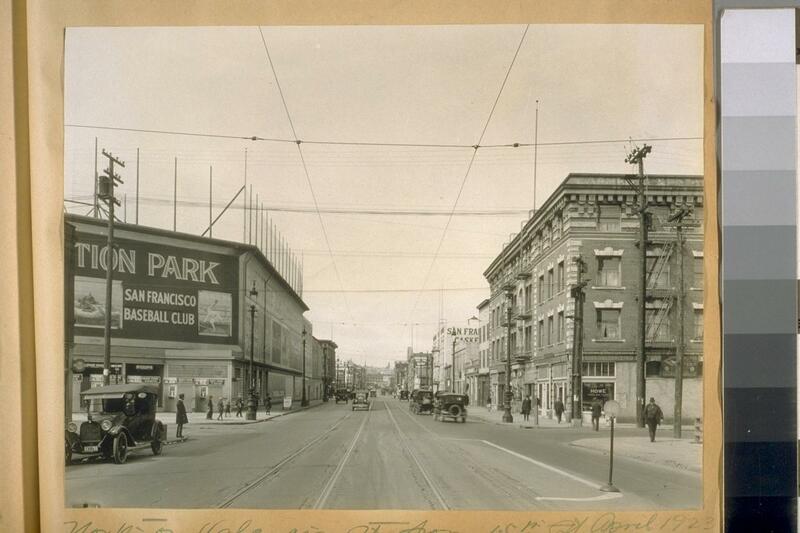 Also, to appreciate Old Rec on 15th and Valencia, Babe Ruth also sponsored a game there with kids back in the 1920’s. So to think the the great Babe Ruth was around that neighborhood, seems unbeliebable..
What year was Babe Ruth at the Recreation Park. My Grandfather was Bill Rodda who played for the San Francisco Missions between 1926 through 1930. Of course! I’d be honored. Wonderful research. The Giants played at Seals Stadium for two full seasons, 1958 and 1959. Thanks, fixed that — deep down I’m a hockey guy and am used to seasons that span calendar years. This is an awesome collection of photos. Stadiums these days are so modern. I was at Yankee stadium once for a full house game and boy was it something. It was a great experience to watch a live baseball game in front of thousands of fans. Excellent use of photos and Sanborn maps! 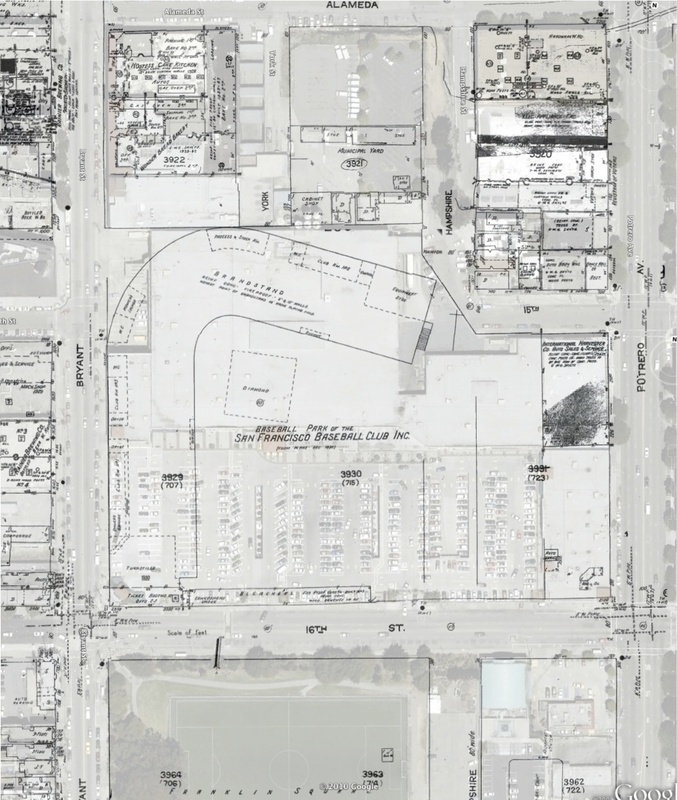 In the San Francisco Historical Photograph Collection, there is a Department of Public Works 1937/38 aerial survey -that has not been digitized. In the photograph sheet that includes Seals Stadium – a baseball game is happening! Now I’ll have to figure out if it was the Seals or the Mission Reds. You should come check it out! Thanks! One of these days I will take a week or two off of work to do research, and the photo archives are on the top of my list. And let me know when you scan that photo! I work out at the 24hrs fitness there. I assume it would have been somewhere behind the dugout on the 1st base side. So next time I run on a treadmill, I will feel nostalgic thinking that this could be right where Joe DeMaggio was taking a shower or young Willie Mays was talking to media as he ties his spike shoe. It’s always a shame when a bit of history is taken down. Even if it is only baseball, especially such old baseball always has a certain magical element for me, and when I go to old stadiums, it is almost like I can still feel the old games being plaayed there. I wish I could of been there in San Francisco to see all those angry texas fans walk out. What a great entry. The research is amazing. Thanks for doing all this digging. There were many more baseball teams that played in San Francisco than the just the Seals and the Mission Reds! Wow! I knew there were more, but not that many. The references to the Sea Lions are pretty interesting, especially the barnstorming the team did after the WCNBL league folded right after it started in 1946. My Portuguese-American great grandfather, Irl Joseph De Fount, played catcher for San Francisco Baby Seals in California State League in 1910 when he was 18 years old and later for the San Francisco Seals as well. The San Francisco Baby Seals were a “feeder” Class “B” minor league team for it’s parent club the San Francisco Seals. Irl Joseph De Fount was also a professional boxer in both San Francisco and in Los Angeles, California. He twice fought at Madison Square Garden (not the one in New York but the one in Los Angeles) in the early 1920’s. He was known as the “Battling De Fount” in boxing circles at the time. I remember the old ball grounds at 15th & Valencia. At least the outside. I was just a tot and my dad would point them out when we drove by. He told me he had once played semi-pro ball, bur I think not for the Mission Reds. But it would have been in the 1926 – 1930 era. He was a big fan of Joe DiMaggio, being Italian himself, and used to remark all the time on how Joe was doing back east. In the mid 1930’s he opened a grocery store on 14th St. between Guerrero and Valencia. BTW, I’m one of the gals in the photo of the fans taken at Seals Stadium. There was a group of 5 of us who always sat near the Seals dugout. Wow, that’s amazing! We’d love to hear any other stories or see old photos. The icon is randomly generated — if you click on it, you should be able to create an account and change it to whatever you want. Oops, how do I get rid of the angry bird icon? By its fifth season, the show was the second most watched prime time show on The WB Television Network. forces continue to monitor the suspected pirate mother ship, officials said. He’s a news writer and columnist for American – Daily. and preservatives, or an iceberg lettuce salad.